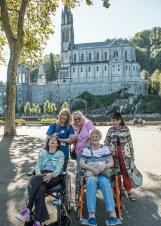 Since 1975, HCPT has offered life changing Summer pilgrimages to Lourdes for disabled and disadvantaged people of all ages. Pilgrims stay for a week at HCPT's Hosanna House, an attractive and tranquil home-from-home in nearby Bartrès – with spectacular views of the Pyrenees. The house was opened as a response to young pilgrims who wanted to enjoy the HCPT Lourdes experience as adults. 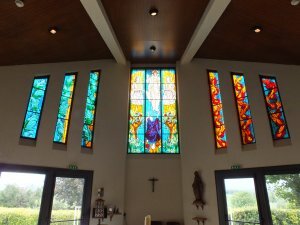 Over each Summer more than 1,500 people enjoy the house, its chapel and other fully accessible facilities, and its proximity to the shrine of Lourdes. HCPT will organise every aspect of your pilgrimage holiday – from flights to dietary requirements. Hosanna House is 10 minutes walk from the centre of the village of Bartrès, where St Bernadette spent much of her childhood with family. The parish church is popular for visitors, as well as the sheepfold where she tended her sheep – which is still in daily use. HCPT is particularly proud of the stained glass windows in the Hosanna House chapel. The central window depicts Christ in an Easter Garden, flanked by windows on either side depicting Psalm Sunday and Pentecost. To find out more about staying at Hosanna House, why not find your nearest HCPT Summer Group? Hosanna House is also a popular base for school trips. Find out more about what we can offer those groups.